On a public tree go any page in an ancestor’s profile. On the top right there is button that says TOOLS. 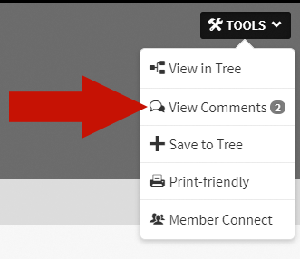 Click it and get a drop down menu that includes the item View Comments. What if they have no tree? First double check that they have no tree. Although it may say No family tree on your matches page they may actually have one. Click the View Match button and the next page, the page with the match information may have a tree available in a drop down list which says select a tree to preview. This tree is just not linked to their DNA. I am a genetic genealogist doing research on the Munson family and you match many of us well. I have much information about the emigration from Norway and pictures of those ancestors to share with you. Since you do not have a tree, I can only guess which branch you belong on. If you do not know, the names and dates of your grandparents might be enough for me to figure this out. When I get no response after about a week, I click their name on the match page to go through to their profile. There is an orange button there which usually generates an email. Another tip is to put your email address in the subject line, I replace the @ with “at” so for example myname at gmail (leaving off the dot com). The reason for that reformatting is to evade spam filters. Why put your email address there? People whose memberships have lapsed or were never activated will see that they have a message but they cannot read it. They can, however, see the subject line or so I am told. I had a case where I found the person’s email address and location from a message board as Blaine recommended. Further googling found his obituary from a year ago. A people search site gave me his widow’s contact information which I passed on to my client who was looking for his grandad and needed more possible relatives to test. She was very kind and put my client in touch with her son. Not the reason one wants for failure to respond! Now that you know how to leave comments on people’s trees, please try to keep them helpful and constructive, not mean or whiny … kindness gets the best response. Thanx! This is very informative. Clears up a few things as well. Clever! Thank you so much for sharing these methods and comments with us. Hope everyone leaves a message / comment for Ancestry to fix the app gliches. Ditto Trish’s comment. I had no idea that my matches might not be getting my messages. Thank you for the workaround tips. When I have been able to trace pedigrees back to what what looks like common ancestors, I include that lineage in my message to a potential match. I have a question for someone who knows the answer: I am confused about what constitutes a MRCA for an autosomal DNA match. I understand with a test such as a y-DNA that there would be a single individual who would be the MRCA …. but with autosomal matches is it more appropriate to identify an MRCA couple (husband and wife). The matching DNA could be from either the male and/or female’s DNA? Stephen – unless there are multiple partners, the MRCA is the couple since both are your and your matches ancestors. In my tree I have a few cases where my newly found cousin is from a different spouse. I actually travelled to Norway with my half 4th cousin found with DNA! Thanks Kitty. That makes perfect sense. I too have such a case of a half-MRCA ancestral connection. In that case, it is easy to identify the individual from whence the common autosomal DNA connection came. Keep the great articles coming. When I click on the link that someone has posted a comment to an image, I am only taken to the ancestry site, not to the item itself with the link I’m the email. Then I have to figure out where that item is to find the comment. Am I using the wrong browser or missing something evident? Thanks for the great article. I think you just need to already be logged into your ancestry account so that when you click the big green button in the email it goes to the comment. I just tried leaving comments for myself on both a photo and a profile using a cousin’s account and they came right in as email messages. Also in chrome on my pc the big green button took me stright to the page with the comment. Roberta, this feature has not worked for me for one year! The links take me to the signin page only. Excellent article, Kitty!! I have a question; do you know if your hint on ‘view comments’ to create an email, works if that persons subscription has lapsed? Kitty. Thanks for this post. I have been trying to get a close connection to respond and tried many of these things but your list is the most inclusive I have seen. My most interesting match never did respond but finally his brother tested and he responded in a day which got me the confirmation I was seeking. Your blogs are always informative but this is an especially frustrating issue for many of us. Thanks! I like your idea, but I’m going nuclear on a match! He’s a young guy, on Facebook and in a county genealogy group for where our ancestors lived in the 19th century. He and I share matches from BOTH sides of my father’s family. How I am doing it? I’m posting a screen shot of our shared matches with surnames slightly blurred out. His AncestryDNA profile photo has just the face slightly blurred out, but he’ll know it’s him. Maybe this will get his attention or the attention of someone who knows him. Thanks, Kitty. Great ideas. I suggest that everyone reading this contact Ancestry and tell them to put the messages on apps and tablets, etc. Without contact to our matches all this is useless in some ways. There will always be problems with getting responses from our matches, but this is another avenue to try, at least. Wouldn’t it be nice if everyone was offered the ability to Opt-In to have our REAL emails show! LIKE button pressed. Good thoughts. I recently put my email in the “About You” section on the profile page because I recently read somewhere that we don’t get messages when we don’t have a paid subscription. I currently have a paid subscription but might not at some point. I don’t know if that is true or not but I want my matches to be able to contact me. Always a good thing to do. My email address is in my profile too. I typically use my iPad to research on Ancestry. The mail icon has been at “99”messages for more than a year, so no way to readily prompt a new message received. There also appears to be a delay in receiving some messages. Use your Safari browser to access Ancestry and AncestryDNA. I do it that way even though I have the app. Every time I read one of your postings I wish there was a “Like” button! I am on My Heritage. Do you have any advice for folks that use that platform? Thanks! Ok, thanks. I will be on the lookout for it. Happy Holidays! Also, when messaging someone it is helpful if you add the Gedmatch number, then they can look it up if they are on GedMatch. I have my GEDMatch numer (and my Dad’s and brother’s) in my profile at ancestry – also my email address spelled out. Sending it in a first contact message is not a great idea in my opinion because that is too geeky for many ancestry users. I wait until we have established contact myself. HI! Thanks a lot. I was also very frustrated at sending messages to possible cousins with no response at Ancestry. Still have to upgrade to get some more info. Thinking of trying 23 and me. Thanks again foryour explanation . I have tested at Ancestry and 23andMe. My kids had several 2nd cousins on the paternal side test on 23andMe so for them the results were great for my side Ancestry has had more identifiable matches. I have also transferred to Gedmatch, FamilyTreeDNA and My Heritage. My personal advice is to fish in as many ponds as possible because you never know where the match that will break down the wall has tested at. Thanks for being so observant and for going to bat for us. I just got off the phone with Ancestry and asked them point blank whether or not they had fixed the “Apple/Message” problem. She said it was weird that I called as she and her co-workers were just discussing that very subject. They are aiming for the end of the week, Friday, and that they would be notifying everyone to do a re-install. I’m sure she meant an update, but glad everyone knows about this and they have an end date. The power of the press! Thanks for letting me know that my blog had such a good effect. The comment thing is a Great Idea!! I forsee some commenting in my future. I’ve been having success in telling them to look mu up on Facebook. I’ve gotten more responses since I started doing that! Leaving a comment does not always guarantee a reply, I have left many comments on profile pages with no result. The comment just guarantees that they get an email. That’s all. Sending them a message in the messaging system does not always. I will share that I got an angry response once from leaving a comment on someone’s tree, so just be aware that some people aren’t aware others can leave a comment on their tree and may become angry that you left a comment on THEIR tree. Excellent post. Another suggestion I would like to add is you should never approach someone with the idea that they are not as proficient or as knowledgeable as you are. I have gotten some messages from people that are almost insulting. One woman asked dubiously if I had done this and this and this and I had done them all. This is a great way to turn off a potential source of new information. We have no idea how many classes and books a complete stranger has learned from, or how much material they have from their parents and grandparents. I didn’t know that if someone uses the app that they do not get confirmation of a message. That’s not right. I agree with Johnda about the need to ‘Still have to upgrade to get some more info’ on Ancestry. I have joined AncestryDNA but not Ancestry so it’s very frustrating when my matches have a tree but I can’t see it! When I click the tree Ancestry website wants me to upgrade and demands more money! I assumed (naively) that testing the DNA would provide access to the tree site. Am I the only person in this position? It would be great if people could put their ancestral surnames/places in their profile page. Even the most recent names would help. Just a few clues. Some people respond to messages; some don’t. Same on every site, Gedmatch included. Dee – This is one of the things I prefer about FamilyTreeDNA, plus you have more choices about who can see your tree. I have made the trees there visible to matches only, and with the anyone born in the last 100 years private. I’m hoping some of the matches at Ancestry will transfer to FtDNA and Gedmatch and then we can reallt drill down (using the chromosome browser) to have a look at in-common-with relatives etc. Thanks Rachael, good advice. I can make a tree (free?) on Ancestry but not view the trees of other folk. I realise now that Ancestry is two separate products – Ancestry tree and AncestryDNA. I think they should mention the need to pay extra for the tree side of things if you’re just signing up for the DNA side. It’s heavily marketed here on TV. Thanks Kitty for allowing our discussion on your excellent blog! Thanks Kitty, I will look at the link. I don’t have a problem with spending money, however I refuse to join a site that requires a yearly subscription. I think Ancestry should have a one-off joining fee offering access to all areas. Another way I am hoping to make contact with matches/relatives is by uploading their ancestors’ graves to Findagrave. The graves of the couple who emigrated in the 1850s were transfered to me a while ago. While trying to fill in the tree and work out the connection to the two matches closish matches from this line I’ve realised that the grave of grandparents of one of them are in my city. I invite matches to view my family tree rather than messaging them. Does anyone know if they receive the invitation if they have the app? I love your idea! Do you mind if I copy your idea? I love the information you shared. It is invaluable! You mentioned in your blog The Munson Family. Was that just an example? My many times great grandparents were Ralph and Catherine Munson? Griffin. Thanks for giving us information! I always use the orange button on the DNA match page on Ancestry. If they don’t have a paid subscription, the green button on the profile page can only be viewed by those who have paid subscriptions. I like these ideas as I get only about 10% response from matches. If the different colored buttons have a role in responses, then maybe I will try sending my messages both ways in the beginning and see what happens. I think people often change their email addresses for various reasons and do not think to change to the new one on these sites. So, they don’t get our requests. I can attest to this with one match. After I reminded him to fix it, all messages went through just fine. Ancestry and some other test sites do not display instructions for use in a prominent place, and many testers never go beyond the home page and/or that ethnicity chart. This does a disservice to all of us. It probably does not do much good to preach to choir here, so I would encourage everyone who is frustrated with the lack of responses to contact the test sites and suggest improvements. If they don’t hear, they don’t fix it. And once again I’m caught in the match doesn’t respond trap. Recently I had a 1680 cms match pop up on Ancestry. Needless to say I was really excited. Looking at their profile page they have been a member since 2018, and last logged in on Nov. 8. They just turned up as a match on Nov. 29, so theoretically they haven’t logged in since we matched. No email, no tree, no age or location data. So I sent a pretty plain note to the green button on the 30th. I re-read this post, then Blaine’s, and have done quite a bit of Internet searching. Apparently this is a pretty common name. It hasn’t made sense so far to start throwing hundreds of emails out there in a fishing expedition. So I tried sending an invite to a tree, or to see results. There are literally fifteen users on Ancestry with the same username. And the most interesting thing is, NONE of them share dna with me. So I have no way of knowing if I send an invite if it goes to the right person. And, apparently the user database has not been updated for some time. There are no users with that name I match with, nor have logged in within several months, or Nov. 8 to be specific. It really is frustrating that Ancestry cannot find a way to make it easier for new folks to receive messages, and for others to send them messages, particularly when there are multiple users with the same username. That, and their user database does not appear to be updated regularly.